Melbourne Trio 723 - A Melbourne Band for Hire at Weddings. Melbourne Trio 723 is made up of some of the most experienced young musicians in Melbourne’s cover band industry, with the aim to provide a unique experience that can cater to almost any setting. Melbourne Trio 723 pride themselves on their professionalism and their “no matter what it takes” attitude to satisfying their audiences, while also creating a fun and memorable experience for everyone to enjoy. Melbourne Trio 723 has proven experience, having worked at weddings, corporate and private functions as well as regularly in pubs and clubs for more than ten years. The band is flexible enough to cater to almost any setting, for any purpose, in any venue. With a very extensive song-list, Melbourne Trio 723 is also open to any special requests you may have for your occasion and are more than happy to learn specific songs too. 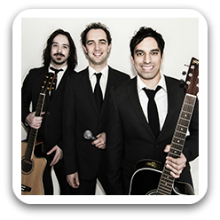 For guaranteed quality entertainment, look no further than Melbourne Trio 723 for your next event, wedding or function.